For years we&apos;ve been led astray thinking that Sanrio&apos;s iconic Hello Kitty is a white, fluffy cat with a red bow clipped below her ear: Hello Kitty is, in fact, not a cat. Christine R. Yano, an anthropologist from the University of Hawaii who is curating the upcoming Hello Kitty retrospective at the Japanese American National Museum in October, told the L.A. Times that she discovered this when the Sanrio folks corrected her after she described Hello Kitty as a cat in her written texts for the exhibit. "I was corrected — very firmly," Yano said. "That&apos;s one correction Sanrio made for my script for the show. Hello Kitty is not a cat. She&apos;s a cartoon character. She is a little girl. She is a friend. But she is not a cat. She&apos;s never depicted on all fours. She walks and sits like a two-legged creature. She does have a pet cat of her own, however, and it&apos;s called Charmmy Kitty." This "Hello Kitty is not a cat" reveal has had our colleague, Jen Chung, over at Gothamist questioning everything now: "Next are they going to tell me that my Melody is NOT A BUNNY, that the Little Twin Stars are NOT TWINS, that Keroppi is NOT A FROG?" Hello Kitty may not be a cat but she has a surprisingly specific backstory: she is British, her real name is Kitty White (no relation to Breaking Bad&apos;s Walter White), and she&apos;s the daughter of parents George and Mary White. She has a twin sister, is stuck in time as a third grader (even though she turns 40 this year), and lives outside of London. She has a horoscope sign, too: she&apos;s a Scorpio. And fun little fact, if you&apos;ve been wondering why Hello Kitty doesn&apos;t have a mouth, Sanrio explains it on their website: "Hello Kitty speaks from her heart. 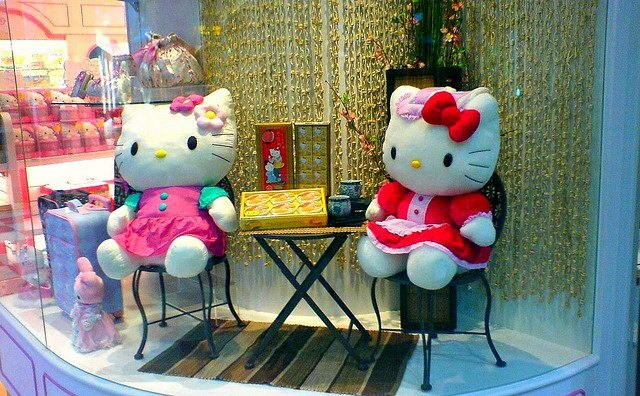 She’s Sanrio&apos;s ambassador to the world and isn&apos;t bound to any particular language."